...because you NEED one more treat for Valentine's Day. You do! These peanut butter blossom-ish cookies are made with Nutella instead of peanut butter. There's also a bit of cocoa powder in the dough. 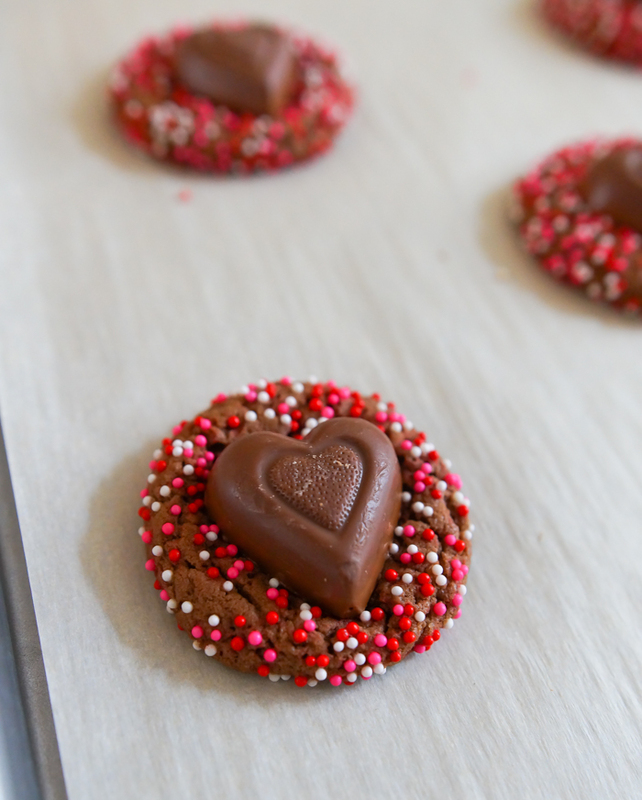 Rolled in Valentine sprinkles (nonpareils) just before baking, the cookies have great crunch! 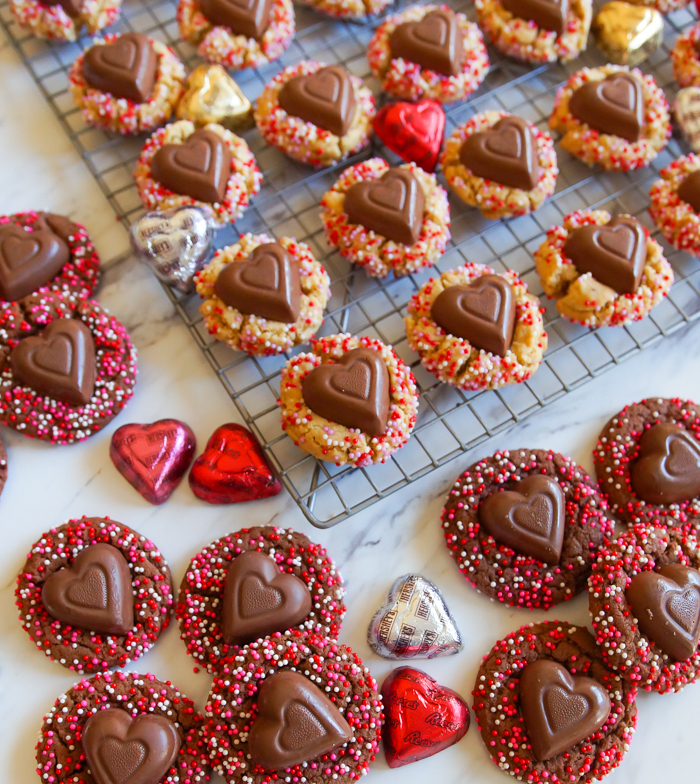 One of my favorite things about peanut butter blossoms holds true here...that chocolate heart pressed on top stays a little soft. So good! So pretty! So Valentine-y! Did I mention that they're a snap to make? No? Well, they're a snap to make, so if you're looking for a last-minute cookie for lunch boxes, school parties, or to take to the office, you've found it! 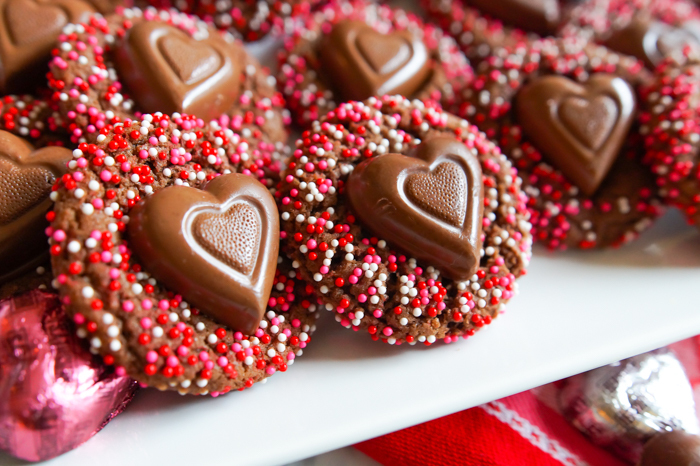 Oh, and never fear...I did make a peanut butter blossom version, too, using this recipe and mini Reese's hearts. Start by making the dough. Refrigerate for about 30 minutes before scooping. A 2-teaspoon (not tablespoon) cookie scoop is perfect for these. Scoop the dough, then roll in sprinkles. 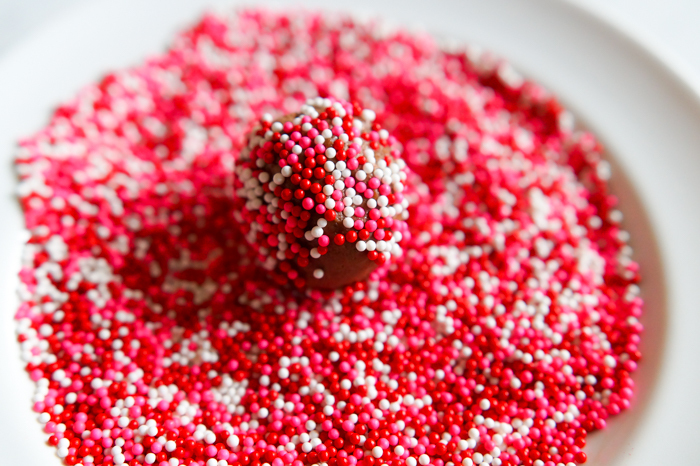 Look for Valentine nonpareils at your grocery store, Target, WalMart, or Michaels. Place on the cookies sheet and bake. 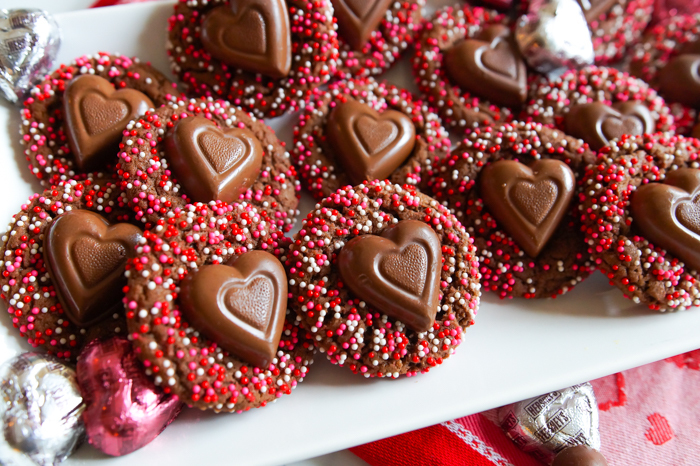 Immediately after taking the cookies from the oven, press a chocolate heart onto the top of each cookie. 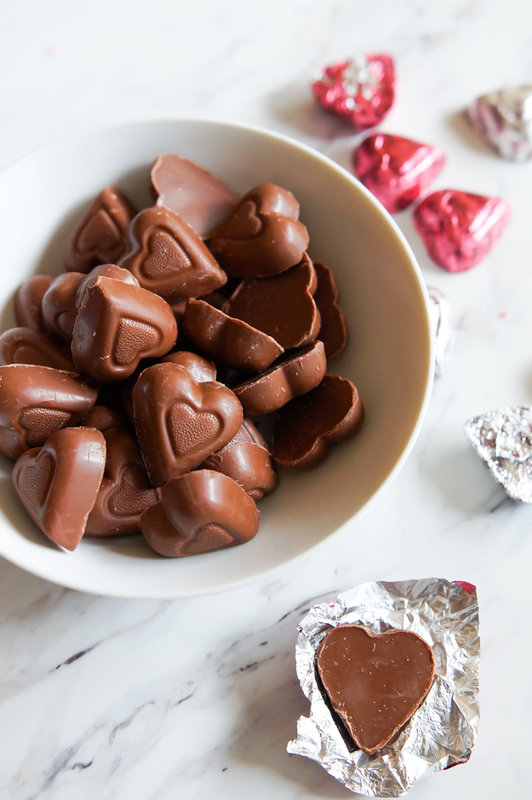 (Have those chocolates unwrapped and ready.) Remove the cookies to a wire rack to cool completely. 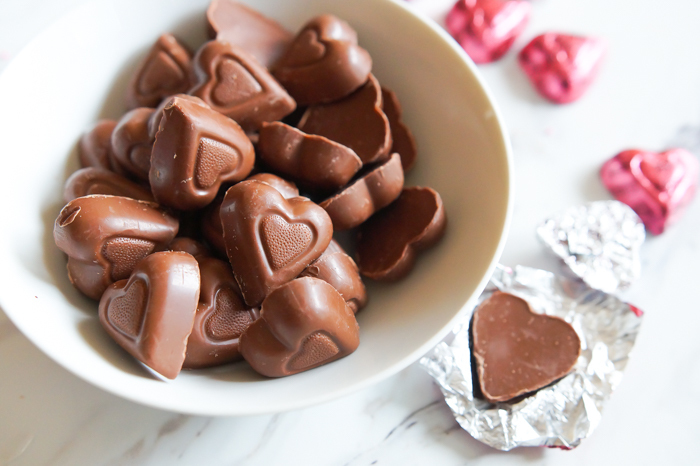 You'll also want the chocolate to set back up before packaging. Line cookie sheets with parchment. Preheat oven to 375. Whisk the flour, cocoa, baking soda, and salt together. Set aside. 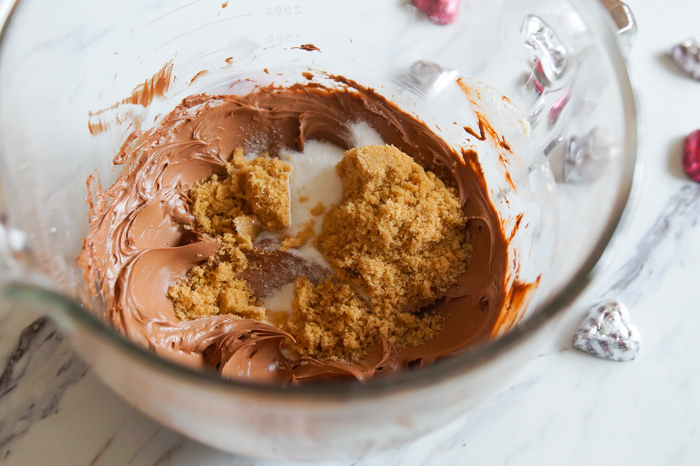 In another bowl, beat the butter and Nutella together until smooth and creamy. Beat in the sugars. Add the egg and vanilla and mix until incorporated, scraping down the sides and bottom of the bowl as needed. Add the flour on low speed, beating just until combined. refrigerate for 30 minutes. Use a 2-teaspoon cookie scoop to portion the dough. Roll in the sprinkles. Place 2 inches apart on the cookie sheets and bake for 10 minutes. 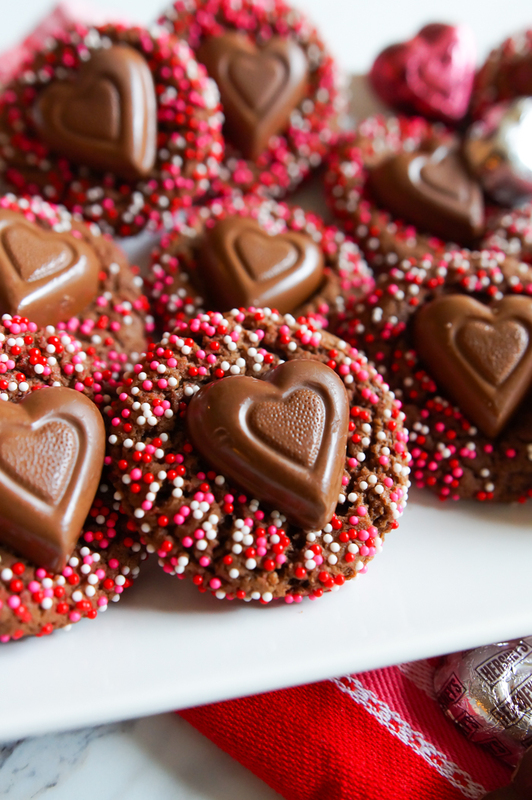 Remove from the oven and immediately press a chocolate heart on top of each cookie. Remove to a wire rack to cool completely. Let the chocolate cool and set before packaging. What's the yield this recipe generates? I don't need an absolute certainty number, just pretty close would be great. Has anyone made these that remembers? Sorry...it's on the printable page. Around 40. I ate a few along the way, so I don't have an exact number. Ha. These are so cute and I'm sure they're delicious. With Nutella how can they not be? :) I'm visiting Houston for the first time next week and can't wait to go to an HEB. Any suggestions for any items I "have to have" from there? This recipe looks delicious and festive. I may considered making this for my family.